Before I go any further, I would like to acknowledge that tattoos are a controversial subject--not only because they are forbidden under religious law, but mostly because of the weight they carry as signifiers of the Holocaust. This article does not in any way aim to diminish the very real suffering of millions of people. However, because tattoos are a large part of youth culture, both here and in Israel, I felt it was appropriate to cover it as just that--commentary on a cultural trend. *This post is brought to you by the 'Oy Vey' Meter: 0% is kosher. 100% is OY VEY. **This post is also brought to you by a Jew with two tattoos. I'm a veritable expert. Military Pride: Perhaps not the most original, but neither are military tattoos in the US. Kind of boring, but not bizarre. 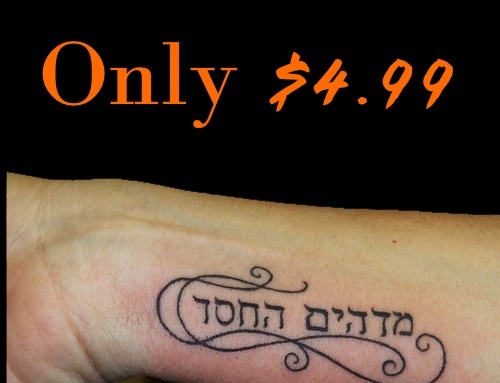 Hebrew for You: I actually think this one is pretty badass. The design, the eye, the sheer size of it--it's a winner. The Menorah: This is what happens when you lose a bet. Chai and a Star of David: It's a little cliché and a little boring. 'Meh' is about the highest ranking I can give it. Mystical Ink: This tattoo gets points for being unique and nicely executed. It's not my aesthetic, but I absolutely think it's worthy of respect. Chasidic Boy: WHY?????? This is so bad on SO many levels. Gam Zeh Ya'avor: Simple. Delicate. To the point. The placement is a bit, uh, sensitive, but then again, if you're getting words inked onto your wrist or forearm (like myself) you've thought about that already. I dig it. Eye See You: I'm also the proud owner of a hamsa, so I'm a bit biased. This is pretty cool. The red details are unique, and the eye is pretty realistic and disturbing. My mom would not approve. Hamsa Chic: I love this. I want it on my back. NOW. The colors, the design, the placement--it's just lovely. Don't Kotel on Me: The idea is unique--the execution is questionable. Those blurry red boxes behind the Star of David are supposed to be the stones of the Western Wall. I WANT to like this. But have you seen the Kotel? It's not red. White ink exists (I know because it's been used on me.) I just wish the artist had utilized it a bit more. The Jewish Journal believes that great community depends on great conversation. So, jewishjournal.com provides a forum for insightful voices across the political and religious spectrum. Most bloggers are not employees of The Jewish Journal, and their opinions are their own. Our entire blog policy is here. Please alert us to any violations of our policy by clicking here. (editor@jewishjournal.com). If you'd like to join our blogging community, email us.